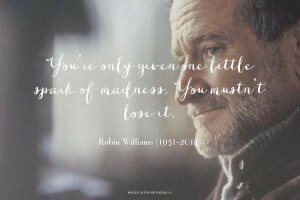 Robin Williams is a man who made many of us laugh, in a world he knew is all too dark. I’ve always considered the line “laughter is the best medicine” to be one of the best pieces of advice a movie has ever given me. The Genie in Aladin was one of my all time favourite childhood characters. He was a comedian, an artist, an activist and no doubt many other things to many people. Previous Previous post: WA Farmer’s fear for livelihood as fracking moves in.